Time to get your digital magnifying glasses out and enjoy a Star Trek scavenger hunt. 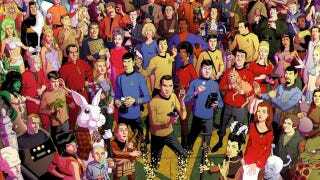 Dusty Abell, creator of the 1970s superhero panorama, has illustrated tons of characters, ships, and creatures from the original Star Trek series, assembling in a single, enormous poster. You can see the full-sized, detail-packed poster at deviantART. If Abell has you stumped, he has also posted a key. I'm just happy the Unicorn Dog is front and center.